Karthaus Furnace has the distinction of failing twice, first as a charcoal furnace and second as a coke-fueled furnace. Peter Karthaus operated the charcoal furnace. After emigrating from Germany he bought a large tract of land in Clearfield County. Seeking to exploit iron ore deposits and forests on his land, he partnered with the Rev. Frederick W. Geissenhainer and erected a furnace, forge, gristmill, and several large houses about 1817. However, the partners had little local market in the sparsely settled area and lacked adequate transportation to more distant markets. An observer noted, "Peter manufactured iron, but behold, there was no way to get it to market; he made ready his mills, but alas, people grew no grain in the woods, and, of course, his toll dish was not often filled. Peter's works were very complete, but they stood idle." The firm of Karthaus and Geissenhainer dissolved in 1818. 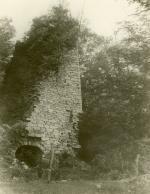 Remains of the Karthaus Furnace, Clearfield County, PA, circa 1890. After an interval of almost two decades, two other groups of owners tried to make iron at Karthaus using a very different fuel. Peter Ritner and John Say built a new coke furnace in 1836. The Clearfield Coal and Iron Company, with four other partners, made pig iron with coke in 1838-1839. However, by the end of 1839, this firm also failed. The coke furnace went out of blast due to poor transportation and poor-quality iron ore. 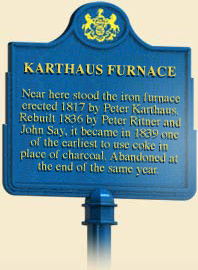 The coke-fueled Karthaus Furnace was one of several furnaces that attempted unsuccessfully to use coke in the early nineteenth century. Thomas Lewis, who helped build the first puddling and rolling mill at Plumsock ( see Meason House), was familiar with the use of coke in British iron furnaces. He was the first in America to use coke in a furnace, at Bear Creek Furnace, which opened in 1819 in Armstrong County. This furnace quickly closed down because of inadequate blast. Fairchance Furnace near Uniontown made coke iron in 1836, but the ironmasters were dissatisfied with the quality of their product and went back to charcoal fuel. Ironmasters at a furnace in Ferrandsville also tried firing their furnace with coke in 1837-1839, but abandoned the effort because of poor-quality coal. These ironmasters attempted to use coke because western Pennsylvania was rich in bituminous coal from which coke was made. Yet, while many eastern Pennsylvania ironmasters, such as those at Robesonia Furnace were changing to anthracite coal as fuel, ironmasters in western Pennsylvania were slow to use bituminous coal and coke. One major impediment was the quality of the coke and bituminous coal. 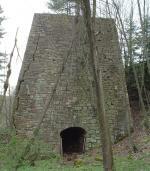 The remains of Karthaus Furnace, by Ian Straffin, Meadeville, Pa, 2005. Before 1840 bituminous coal came from beds that had too many impurities, which contaminated the iron during the furnace smelting process. The coke-making process in use before 1840 did not drive off enough of these impurities to make coke iron feasible, as the owners of the Ferrandsville furnace discovered. However, during the 1840s, coal companies began to exploit the newly discovered Connellsville section of the Pittsburgh bituminous seam. This coal had fewer impurities and proved to be superior for making coke. Also, beehive coke ovens came into use, which produced a higher quality coke than earlier coking methods had. Despite these advances in producing coke, there were only four coke-fueled furnaces erected by 1849. Before coke furnaces could flourish, western Pennsylvania ironmasters had to overcome another major problem–the demand for and quality of coke iron. Before 1850 blacksmiths and other customers in the predominantly rural markets for western Pennsylvania iron demanded wrought iron made with charcoal, which they could fashion into a range of products. They did not want iron made in coke furnaces, which was less malleable and therefore less easily shaped. However, the markets for western Pennsylvania iron changed significantly during the 1850s. Customers increasingly demanded iron rails for expanding railroads, boilerplate for steam engines, and castings, all of which could be made from cheaper coke iron. Improved transportation, particularly construction of the Pennsylvania Railroad to Pittsburgh, also helped widen markets and increase demand. By 1856 twenty-one coke furnaces in western Pennsylvania produced 40,000 tons of pig iron annually. This was still a small fraction of the total iron manufactured in Pennsylvania, but by then coke furnaces had begun to take off. When Peter Karthaus built his furnace in 1817, he used the only fuel that had proven successful in Pennsylvania–charcoal. His successors who attempted to use coke were ahead of their time. It took ironmasters, coal and coke companies, and changes in markets and transportation until the 1850s to overcome problems that had forestalled earlier attempts to use coke. Gerald Eggert, The Iron Industry in Pennsylvania. (Harrisburg: Pennsylvania Historical & Museum Commission), 1994. J. Frank Snyder, Clearfield County's Centennial (Clearfield: Raftsman’s Journal), 1904.